You long for a life that is purposeful without being pressured, satisfying without being self-centred, and God-focussed without being goalless. You've been inspired by calls to follow Jesus with radical commitment, to desire God, not to waste your life, to live with integrity. You want to live fully devoted to God but have difficulty knowing how to do that, especially given the stress of daily life. What if you thought about serving God like working for a boss? What if you started to work for him, seriously? What if you were to: - adopt his strategic plan wholeheartedly? - follow his instructions before all others? - accept his invitation to enter the family business? - trust that he had chosen the right coworkers for you? - work with a focus on who you work for, not what you do? - take up his mandate to rest? 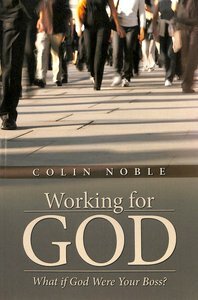 In Working for God, Colin Noble combines stories of life in Japan and Australia with biblical insight, to help you see more clearly what it means to work for the best "boss" of all and to enjoy doing so for the rest of your life. Colin Noble has spent the last three decades living on four continents and working in government, corporate, academic and pastoral settings. He is a graduate of Regent College, Vancouver, and Morling College, Sydney. He lives with his wife and two children near bushland in Sydney, Australia, where he is currently chaplain to a community of 1700 people.